Although WHOAS was still in disagreement with a capture season going ahead this winter, as previously stated we were given the opportunity by ESRD to have first choice to rescue some of the wild horses that were captured. As per our Society’s mission statement, we are committed to doing everything possible to protect, rescue and save our wild horses. Therefore, we as a dedicated group of volunteers we have stepped forward to rescue a large number of the horses caught this year. This is not exactly what our facility is designed for as we thought we would be taking in horses that got themselves into trouble or abandoned by their herds as we have done over the years. 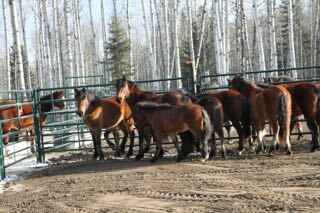 On Thursday evening we were informed that another 11 horses had been caught and transported to the Innisfail auction mart. Even though we were close to capacity, there was no way that we could not respond and do what we could for as many as we could. Attending at the auction, it was decided by our team that we would take seven. 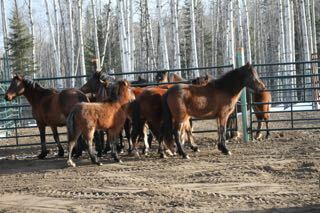 WHOAS right at this point would like to thank the Innisfail auction mart for their assistance they have given us in order to sort and load the horses in a manner that caused the least stress to them. 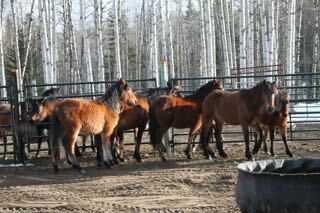 Now located at our facility of the 44 horses caught so far, we have taken in 26 of them. The work is monumental, but our team of volunteers are up to the task and do it with love in their hearts. We would like to thank all those who continue to believe in all that we are doing and for the generous donations we have received.